It is 9 years, and before the current version of 47soton, since I last had a lengthy enough visit to Hungary to include the various stations around Budapest. All of the locomotives have been renumbered to be more compatible with international standards. Notable is the increase number of Stadler FLIRT emus on local services. Here we will have a look at Class 480, similarly new since my last coverage. More to follow from this visit to Hungary, which was unexpected and at short notice. 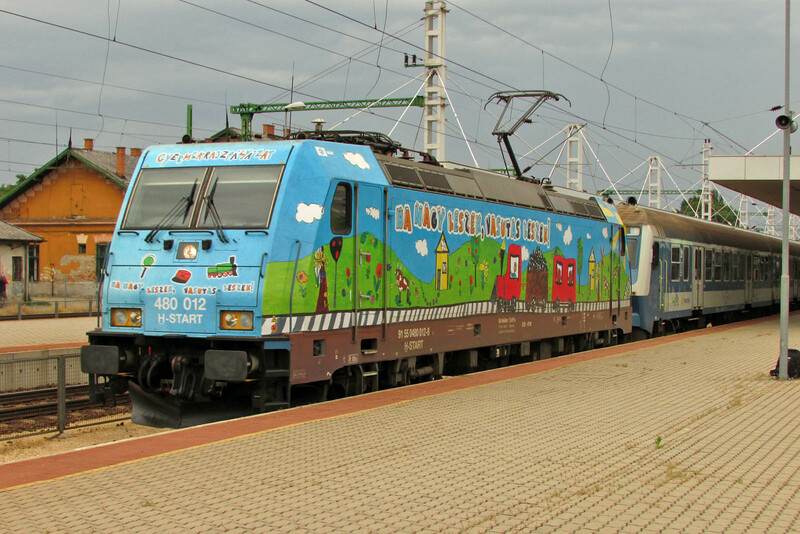 480016 is a member of a class of 25 Bombardier TRAXX locomotives, the newest locomotives in Hungary, completed in 2011-12. The location is Budapest Nyugati (West) station, it may be going to form the 10:30 IC512 to Miskolc or the 10:53 IC704 to Szeged. Nominal power is 5600kW (7500hp), and maximum speed is 160km/h. 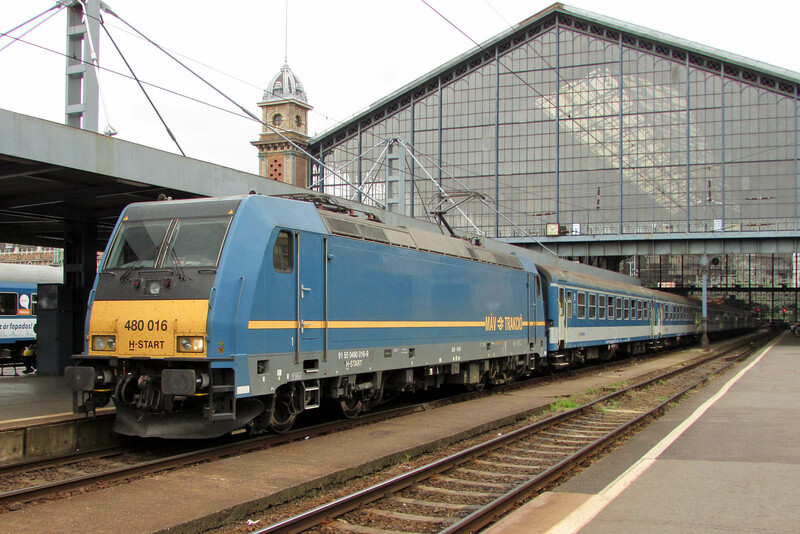 These were intended to replace some V43 locomotives, the ongoing stalwarts of the Hungarian locomotive fleet. 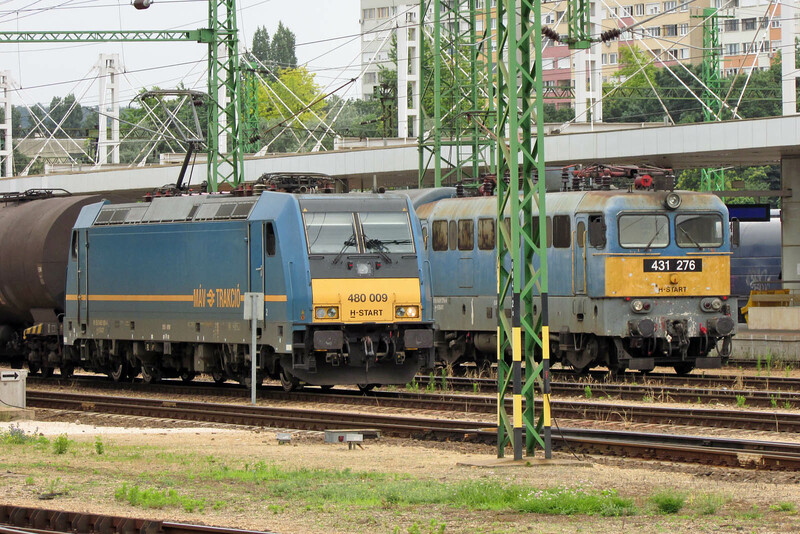 These are 25kV 50Hz and 15kV 16⅔Hz capable locomotives, the latter allowing operation into Austria. The TRAXX family includes the similar DB Class 146.2. 480017 arrives at Kelenföld with what may be IC904 12:24 departure to Szombathely. 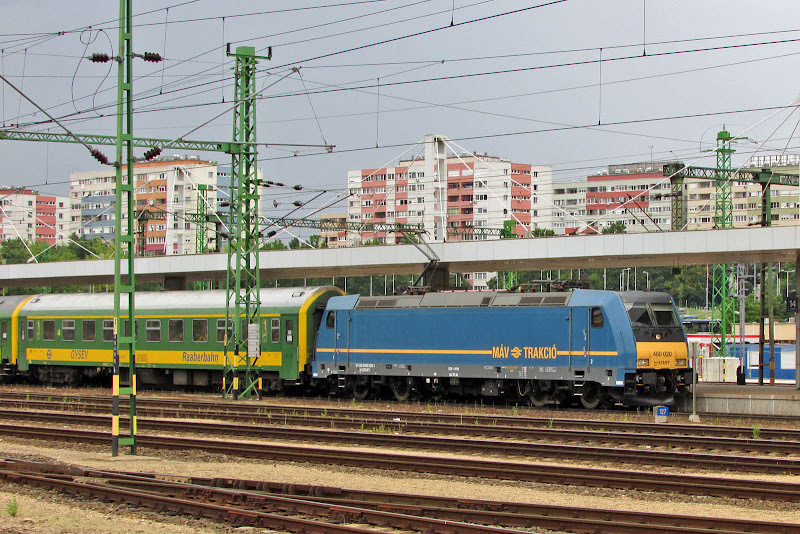 A few minutes later here is 480005 with IC504 12:30 to Miskolc. The vinyls are for Matthias Corvinus, King of Hungary and Croatia from 1458 - 1490. 480012 arrives at Kelenföld station, with a train for Budapest-Déli. The vinyls on this side were designed by schoolgirl Zsofia Haidekker in a contest. 480020 pauses at Kelenföld with a train of GYSEV stock heading towards Budapest Keleti. 480009 waits at Kelenföld with a freight train. V43 431276 is alongside. Kelenföld is at the end of new Budapest Metro line 4 (M4), and is now easy to get to. A day pass for Metro and bus is 1650 HUF (about £4.35), including express bus E200 from airport to Kőbánya–Kispest for line M3. The metro trains now include English language announcements for key intersections - a lot has improved since my earlier visits in 2003-07. The station and infrastructure has been extensively improved and developed with contribution from EU funds. Train departures by timetable at The Trainline Europe.